The cuisine in the good ole’ USA often gets the proverbial “black-eye” from our international counterparts. In comparison to French and Italian cooking methods, American fare is often criticized for being uninspired. As Americans however, we can be enthusiastically proud that the humble hamburger has found an everlasting home in the U.S. – with a very loyal and loving family. We can dress that hamburger up for any event and it’ll be the envy of every diner. Let’s see the French serve a foie gras to celebrate the West Warwick Fireman’s Retirement Dinner! As I have gotten older and grown (in many ways), my burger preferences continued to evolve. Originally, I was a strictly plain cheeseburger-with-ketchup kind of guy, and then in college an epiphany struck, and “chili” on a hamburger lit my culinary path for the next four years. Upon a move back to “The Rhode” in 2000 with my fiancé, it became apparent that my beloved Chiliburgers were no longer as exciting as I once remembered. Recently, I ventured off to a place that satisfied my craving for high-quality creatively prepared burgers. 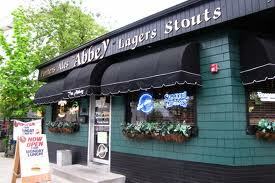 “The Abbey” on Admiral Street in Providence offers up an exciting variety of 10 oz. burgers as well as an impressive 92 beers – need I say anymore? Don’t answer that because I have much more to say about this burger Taj Mahal. While at work, I decided to ask my colleague Jeff to join me for “Operation Burger Feast.” After looking at the extensive listing of burgers, we agreed on two burgers for which to split. With the first one, we went relatively safe with the Smokey BBQ Burger (Bacon, Cheddar Cheese and homemade BBQ sauce). Initially we needed to try a burger that was familiar and knew would excellent. With only three toppings, the quality and juiciness of the hand pattied beef was on full display. The Smokey BBQ Burger delivered on every level, and could have given any other BBQ cheeseburger a run for its money. Our second burger choice was not for the cardiac challenged. It was designed for a hung-over college student, or at least a chemically enhanced one with the munchies. Although we were neither of them, it didn’t matter because on this hungry afternoon we were busy pillaging our digestive systems with the “Hair-of- the-Dog That Bit You” burger. It of the most adventurous and rewarding culinary choices I have ever made. This monstrosity contained 10 ounces of beef topped with American cheese, two strips of bacon, a sausage patty, grilled onions and a sunny-side up fried egg. With the delivery of this carnivorous delight, Jeff and I gave each other a brief look of amazement before diving into it. Everything about this burger worked like a symphony. The country sausage was the surprising star because of the peppery flavor that came through extremely well in the beef. The perfectly runny egg yolk provided additional moisture and mild flavor which allowed the crisp bacon, onion, and beef to stand out. The freshly toasted roll stood up well to the challenge in keeping this oversized masterpiece together. Jeff and I were so glad that we ate out of our comfort zone because we were treated to a memorable combination of deliciousness. Not to be forgotten were the Abbey’s fresh-cut shoestring fries. They were perfectly crisp with a strong potato flavor and some of the best fries I’ve eaten. With 92 beers from which to choose, the options for a belly wash-down were gut busting. The Abbey delivered one great burger at an unbelievable value. At the end of our meal, we discovered that their burgers were half-priced Monday thru Thursday during lunch service only. The Abbey was a pleasant surprise and I can’t wait to work my way through the rest of their menu. God Bless America! !